It has been an exciting first week for all involved with the launch of Women In Tourism (WIT) and we wanted to share our updates with you. The committee have been overwhelmed with emails and messages of support and what’s been great about the project overall is that it has got people talking! Many thanks to all who have given us coverage in the news and the industry, who have shared our tweets, and who have completed our survey so far. The focus of the project at the moment is to encourage industry to share thoughts about the sector through the short survey launched on the 12 January 2016. There hasn’t been any focused research on the challenges and opportunities facing those working in the sector since 2011 and we recognise the need to have fact-based evidence to take the work of WIT forward. 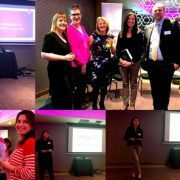 Women in Tourism has had a fantastic reception to date, with input from colleagues outwith Scotland – from our close neighbours of Iceland, Hungary and Germany to our far flung colleagues in Australia! The initial aim of Women in Tourism was, and is, to focus on Scotland first; but with an ambition to grow an international network and use our home-grown framework and collaborative approach as a model of best practice. It’s fantastic to see that interest already there and we look forward to communicating with our our new network as plans progress. For now, we need to keep momentum going and encourage as many colleagues as possible to participate in the survey: it’s open until 19 February 2016. This your opportunity to really get involved in the conversation and help WIT identify which areas we should focus on in the months and years to come. Please follow and engage with @WITScotland and share information on our survey with your colleagues and networks. Many thanks from the WIT Team. This morning Women In Tourism announced one of the first pieces of research into gender equality within the tourism sector across Scotland with the launch of a survey to those working across the industry. The survey is open to individuals at all levels across the tourism sector and seeks to gather thoughts and opinions on topics such as leadership opportunities, career development and remuneration. Welcome to the first Women in Tourism blog and thank you for visiting our site. We hope that you will take the time to read about the aims and objectives of Women in Tourism and that you will consider your own experience of working in this sector and share this with us via our survey, which is open until 19 February 2016.